In a legendary career spanning more than half a century, saxophonist Wayne Shorter just keeps getting better and bolder. Indeed, his longevity as a creative force isn’t as astounding as the fact that he’s spent the past decade leading his most prodigious and consequential band. At 80, Shorter often appears as the calm center of a roiling maelstrom, a mystical presence exulting in the improvisational lightning strikes emanating from pianist Danilo Perez, bassist John Patitucci, and drummer Brian Blade, all virtuosos and bandleaders in their own right. Of course, the quartet is fueled by music from jazz’s most influential composer after Thelonious Monk, still keen to venture into uncharted territory. Shorter’s new Blue Note album, Without a Net, is his first for the label in over four decades and is an astounding document of an artist reaching and exploring, still very much at the peak of his powers. The session netted Shorter 2013 DownBeat magazine Critics Poll wins for Jazz Album, Jazz Group, Soprano Saxophone and Jazz Artist of the Year, as well as a GRAMMY for Best Improvised Solo on "Orbits. "Shorter and his quartet return to the Bay Area tonight for several sold out shows. Shorter's website noted that he'll will be entering his 81st year in 2014—first recorded for Blue Note in 1959 as the precocious 26-year-old tenor saxophonist (and prolific composer) in Art Blakey’s Jazz Messengers, which brought him to the attention of label founder Alfred Lion who eventually signed him to his own recording deal. Shorter went on to make a spectacular run of classic albums for Blue Note between 1964-1970 including Night Dreamer, Juju, Speak No Evil, Adam’s Apple, Schizophrenia, and Super Nova during a period of time that also paralleled Shorter’s years with Miles Davis, first as a member of the trumpeter’s trailblazing quintet, and later as a part of Davis’ early fusion masterpieces. Reflecting upon his perpetual path of musical discovery, Shorter expounded that The challenge we as artists face today is to create a ‘singularity’ or an ‘event horizon’ so that as human beings we will break the cycle of ego dominated actions which through repetition keep us bound to stagnation which denies us entrance to the Portal of Life's Ultimate Adventure! 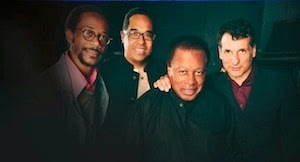 Without A Net is a 9-track musical thrill ride that consists of live recordings from the Wayne Shorter Quartet’s European tour in late 2011, the one exception being the 23-minute tone poem “Pegasus” which features the quartet with The Imani Winds recorded at Walt Disney Concert Hall in Los Angeles. The album features six new Shorter compositions, as well as new versions of his tunes “Orbits” (from Miles Davis’ Miles Smiles album) and “Plaza Real” (from the Weather Report album Procession). The quartet also reinvents the title song from the 1933 musical film Flying Down To Rio, which film buffs (such as Shorter) know as the first on-screen pairing of Fred Astaire and Ginger Rogers."